The Cat Bunk with Den hideaway is a great option for homes with larger breeds or skittish cats that like the security of their own space. 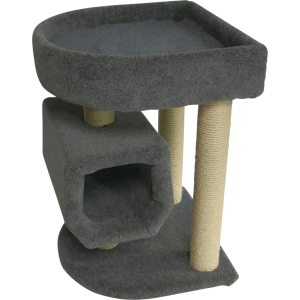 With a large bunk bed filled with comfy cozy vet fleece, 4 poles to scratch on and Cat Den to hideaway, your cat will have a lovely place to sleep and play. The den can be swiveled around to suit your cat, or just to add novelty and interest.